WebMD for iPhone offers physician-reviewed health content and interactive tools in addition to on-demand healthy living information, including tools like Symptom Checker, local health listings, and a health improvement program called Healthy Target. 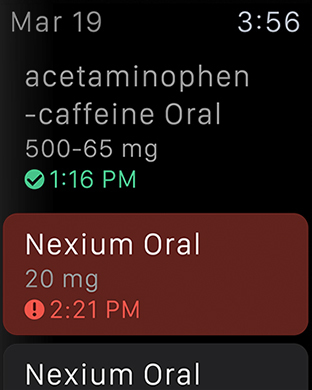 On Apple Watch, WebMD offers support for medication reminders. See your daily medication schedule and information about whether or not you've taken a required dose. 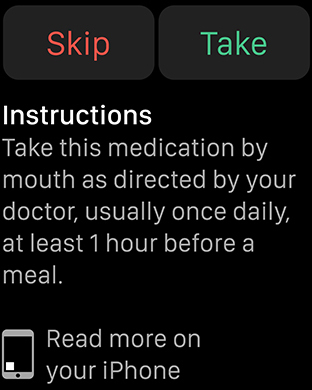 Read medication instructions, such as whether to take a pill with food, and access additional in-depth information on your iPhone via Handoff. 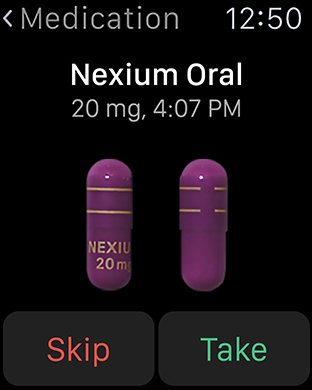 The Glance lets you know what time to take your next scheduled dose (e.g. 12:00 p.m.), or if you're scheduled to take a dose within two hours or less, you'll receive a message (e.g. "Next dose in 59 minutes") instead of the time. When you're prompted to take a given medication, you're asked to log one of four possible actions: Take the Medication, Skip the Medication, Snooze, or Dismiss the Reminder. WebMD is the leading provider of health information services, serving consumers, physicians, other healthcare professionals, employers and health plans. The online healthcare information, decision-support applications and communications services that we provide: Help consumers take an active role in managing their health by providing objective healthcare information and lifestyle information; Make it easier for physicians and healthcare professionals to access clinical reference sources, stay abreast of the latest clinical information, learn about new treatment options, earn continuing medical education credits and communicate with peers; Enable employers and health plans to provide their employees and plan members with access to personalized health and benefit information and decision support technology that helps them make informed benefit, provider and treatment choices. The WebMD Health Network includes WebMD Health, Medscape, MedicineNet, emedicineHealth, RxList, theheart.org, drugs.com and Medscape Education.